This specification describes an application layer protocol for communication between a roaming authenticator and another client/platform, as well as bindings of this application protocol to a variety of transport protocols using different physical media. The application layer protocol defines requirements for such transport protocols. Each transport binding defines the details of how such transport layer connections should be set up, in a manner that meets the requirements of the application layer protocol. This protocol is intended to be used in scenarios where a user interacts with a relying party (a website or native app) on some platform (e.g., a PC) which prompts the user to interact with a roaming authenticator (e.g., a smartphone). Prior to executing this protocol, the client/platform (referred to as host hereafter) and roaming authenticator (referred to as authenticator hereafter) must establish a confidential and mutually authenticated data transport channel. This specification does not specify the details of how such a channel is established, nor how transport layer security must be achieved. 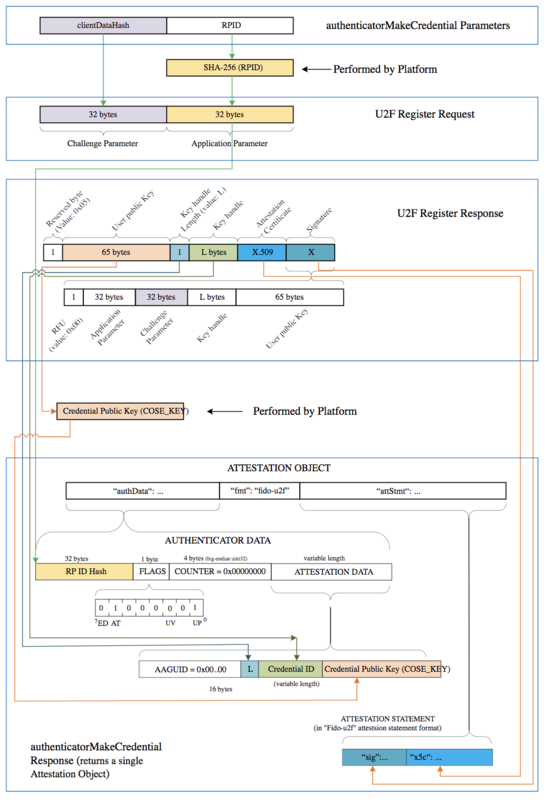 The CTAP1/U2F protocol, which is defined by the U2F Raw Messages specification [U2FRawMsgs]. CTAP1/U2F messages are recognizable by their APDU-like binary structure. CTAP1/U2F may also be referred to as CTAP 1.2 or U2F 1.2. The latter was the U2F specification version used as the basis for several portions of this specification. Authenticators implementing CTAP1/U2F are typically referred to as U2F authenticators or CTAP1 authenticators. The CTAP2 protocol, whose messages are encoded in the CTAP2 canonical CBOR encoding form. Authenticators implementing CTAP2 are referred to as CTAP2 authenticators, FIDO2 authenticators, or WebAuthn Authenticators. Both CTAP1 and CTAP2 share the same underlying transports: USB Human Interface Device (USB HID), Near Field Communication (NFC), and Bluetooth Smart / Bluetooth Low Energy Technology (BLE). The [U2FUsbHid], [U2FNfc], [U2FBle], and [U2FRawMsgs] specifications, specifically, are superseded by this specification. Occasionally, the term "CTAP" may be used without clarifying whether it is referring to CTAP1 or CTAP2. In such cases, it should be understood to be referring to the entirety of this specification or portions of this specification that are not specific to either CTAP1 or CTAP2. For example, some error messages begin with the term "CTAP" without clarifying whether they are CTAP1- or CTAP2-specific because they are applicable to both CTAP protocol versions. CTAP protocol-specific error messages are prefixed with either "CTAP1" or "CTAP2" as appropriate. Using CTAP2 with CTAP1/U2F authenticators is defined in Interoperating with CTAP1/U2F authenticators. The key words "MUST", "MUST NOT", "REQUIRED", "SHALL", "SHALL NOT", "SHOULD", "SHOULD NOT", "RECOMMENDED", "NOT RECOMMENDED", "MAY", and "OPTIONAL" in this specification are to be interpreted as described in [RFC2119]. Transport-specific Binding: Requests and responses are conveyed to roaming authenticators over specific transports (e.g., USB, NFC, Bluetooth). For each transport technology, message bindings are specified for this protocol. This document specifies all three of the above pieces for roaming FIDO2 authenticators. Platform gets information about the authenticator using authenticatorGetInfo command, which helps it determine the capabilities of the authenticator. clientDataHash (0x01) Byte Array Required Hash of the ClientData contextual binding specified by host. See [WebAuthN]. rp (0x02) PublicKeyCredentialRpEntity Required This PublicKeyCredentialRpEntity data structure describes a Relying Party with which the new public key credential will be associated. It contains the Relying party identifier of type text string, (optionally) a human-friendly RP name of type text string, and (optionally) a URL of type text string, referencing a RP icon image. The RP name is to be used by the authenticator when displaying the credential to the user for selection and usage authorization. The RP name and URL are optional so that the RP can be more privacy friendly if it chooses to. For example, for authenticators with a display, RP may not want to display name/icon for single-factor scenarios. user (0x03) PublicKeyCredentialUserEntity Required This PublicKeyCredentialUserEntity data structure describes the user account to which the new public key credential will be associated at the RP. It contains an RP-specific user account identifier of type byte array, (optionally) a user name of type text string, (optionally) a user display name of type text string, and (optionally) a URL of type text string, referencing a user icon image (of a user avatar, for example). The authenticator associates the created public key credential with the account identifier, and MAY also associate any or all of the user name, user display name, and image data (pointed to by the URL, if any). The user name, display name, and URL are optional for privacy reasons for single-factor scenarios where only user presence is required. For example, in certain closed physical environments like factory floors, user presence only authenticators can satisfy RP’s productivity and security needs. In these environments, omitting user name, display name and URL makes the credential more privacy friendly. Although this information is not available without user verification, devices which support user verification but do not have it configured, can be tricked into releasing this information by configuring the user verification. pubKeyCredParams (0x04) CBOR Array Required A sequence of CBOR maps consisting of pairs of PublicKeyCredentialType (a string) and cryptographic algorithm (a positive or negative integer), where algorithm identifiers are values that SHOULD be registered in the IANA COSE Algorithms registry [IANA-COSE-ALGS-REG]. This sequence is ordered from most preferred (by the RP) to least preferred. excludeList (0x05) Sequence of PublicKeyCredentialDescriptors Optional A sequence of PublicKeyCredentialDescriptor structures, as specified in [WebAuthN]. The authenticator returns an error if the authenticator already contains one of the credentials enumerated in this sequence. This allows RPs to limit the creation of multiple credentials for the same account on a single authenticator. extensions (0x06) CBOR map of extension identifier → authenticator extension input values Optional Parameters to influence authenticator operation, as specified in [WebAuthN]. These parameters might be authenticator specific. options (0x07) Map of authenticator options Optional Parameters to influence authenticator operation, as specified in in the table below. (0x08) Byte Array Optional First 16 bytes of HMAC-SHA-256 of clientDataHash using pinToken which platform got from the authenticator: HMAC-SHA-256(pinToken, clientDataHash). requireUserPresence Not present in the current version of CTAP. Authenticators are assumed to always check user presence. Note that icon values used with authenticators can employ [RFC2397] "data" URLs so that the image data is passed by value, rather than by reference. This can enable authenticators with a display but no Internet connection to display icons. Note that a text string is a UTF-8 encoded string (CBOR major type 3). If the excludeList parameter is present and contains a credential ID that is present on this authenticator and bound to the specified rpId, wait for user presence, then terminate this procedure and return error code CTAP2_ERR_CREDENTIAL_EXCLUDED. User presence check is required for CTAP2 authenticators before the RP gets told that the token is already registered to behave similarly to CTAP1/U2F authenticators. If the options parameter is present, process all the options. If the option is known but not supported, terminate this procedure and return CTAP2_ERR_UNSUPPORTED_OPTION. If the option is known but not valid for this command, terminate this procedure and return CTAP2_ERR_INVALID_OPTION. Ignore any options that are not understood. Note that because this specification defines normative behaviors for them, all authenticators MUST understand the "rk", "up", and "uv" options. If pinAuth parameter is present and pinProtocol is 1, verify it by matching it against first 16 bytes of HMAC-SHA-256 of clientDataHash parameter using pinToken: HMAC- SHA-256(pinToken, clientDataHash). If pinAuth parameter is present and the pinProtocol is not supported, return CTAP2_ERR_PIN_AUTH_INVALID. authData (0x01) Byte Array Required The authenticator data object. fmt (0x02) String Required The attestation statement format identifier. attStmt (0x03) Byte Array, the structure of which depends on the attestation statement format identifier Required The attestation statement, whose format is identified by the "fmt" object member. The client treats it as an opaque object. rpId (0x01) String Required Relying party identifier. See [WebAuthN]. clientDataHash (0x02) Byte Array Required Hash of the serialized client data collected by the host. See [WebAuthN]. allowList (0x03) Sequence of PublicKeyCredentialDescriptors Optional A sequence of PublicKeyCredentialDescriptor structures, each denoting a credential, as specified in [WebAuthN]. If this parameter is present and has 1 or more entries, the authenticator MUST only generate an assertion using one of the denoted credentials. extensions (0x04) CBOR map of extension identifier → authenticator extension input values Optional Parameters to influence authenticator operation. These parameters might be authenticator specific. options (0x05) Map of authenticator options Optional Parameters to influence authenticator operation, as specified in the table below. (0x06) Byte Array Optional First 16 bytes of HMAC-SHA-256 of clientDataHash using pinToken which platform got from the authenticator: HMAC-SHA-256(pinToken, clientDataHash). pinProtocol (0x07) Unsigned Integer Optional PIN protocol version selected by client. Let numberOfCredentials be the number of credentials found. If device doesn’t support user-identifiable gestures, return the CTAP2_ERR_UNSUPPORTED_OPTION error. If the "up" option was specified and set to true, collect the user’s consent. If more than one credential was located in step 1 and allowList is present and not empty, select any applicable credential and proceed to step 12. Otherwise, order the credentials by the time when they were created in reverse order. The first credential is the most recent credential that was created. Create a credential counter(credentialCounter) and set it 1. This counter signifies how many credentials are sent to the platform by the authenticator. Start a timer. This is used during authenticatorGetNextAssertion command. This step is optional if transport is done over NFC. Update the response to include the first credential’s publicKeyCredentialUserEntity information and numberOfCredentials. User identifiable information (name, DisplayName, icon) inside publicKeyCredentialUserEntity MUST not be returned if user verification is not done by the authenticator. Sign the clientDataHash along with authData with the selected credential, using the structure specified in [WebAuthN]. credential (0x01) PublicKeyCredentialDescriptor Optional PublicKeyCredentialDescriptor structure containing the credential identifier whose private key was used to generate the assertion. May be omitted if the allowList has exactly one Credential. authData (0x02) Byte Array Required The signed-over contextual bindings made by the authenticator, as specified in [WebAuthN]. signature (0x03) Byte Array Required The assertion signature produced by the authenticator, as specified in [WebAuthN]. user (0x04) PublicKeyCredentialUserEntity Optional PublicKeyCredentialUserEntity structure containing the user account information. User identifiable information (name, DisplayName, icon) MUST not be returned if user verification is not done by the authenticator. U2F Devices: For U2F devices, this parameter is not returned as this user information is not present for U2F credentials. FIDO Devices - server resident credentials: For server resident credentials on FIDO devices, this parameter is optional as server resident credentials behave same as U2F credentials where they are discovered given the user information on the RP. Authenticators optionally MAY store user information inside the credential ID. FIDO devices - device resident credentials: For device resident keys on FIDO devices, at least user "id" is mandatory. For single account per RP case, authenticator returns "id" field to the platform which will be returned to the [WebAuthN] layer. For multiple accounts per RP case, where the authenticator does not have a display, authenticator returns "id" as well as other fields to the platform. Platform will use this information to show the account selection UX to the user and for the user selected account, it will ONLY return "id" back to the [WebAuthN] layer and discard other user details. numberOfCredentials (0x05) Integer Optional Total number of account credentials for the RP. This member is required when more than one account for the RP and the authenticator does not have a display. Omitted when returned for the authenticatorGetNextAssertion method. If the credentialCounter is equal to or greater than numberOfCredentials, return CTAP2_ERR_NOT_ALLOWED. If timer since the last call to authenticatorGetAssertion/authenticatorGetNextAssertion is greater than 30 seconds, discard the current authenticatorGetAssertion state and return CTAP2_ERR_NOT_ALLOWED. This step is optional if transport is done over NFC. Sign the clientDataHash along with authData with the credential using credentialCounter as index (e.g., credentials[n] assuming 0-based array), using the structure specified in [WebAuthN]. Reset the timer. This step is optional if transport is done over NFC. versions (0x01) Sequence of strings Required List of supported versions. Supported versions are: "FIDO_2_0" for CTAP2 / FIDO2 / Web Authentication authenticators and "U2F_V2" for CTAP1/U2F authenticators. extensions (0x02) Sequence of strings Optional List of supported extensions. aaguid (0x03) Byte String Required The claimed AAGUID. 16 bytes in length and encoded the same as MakeCredential AuthenticatorData, as specified in [WebAuthN]. options (0x04) Map Optional List of supported options. maxMsgSize (0x05) Unsigned Integer Optional Maximum message size supported by the authenticator. pinProtocols (0x06) Array of Unsigned Integers Optional List of supported PIN Protocol versions. If present and set to true, it indicates that the device is capable of accepting a PIN from the client and PIN has been set. If present and set to false, it indicates that the device is capable of accepting a PIN from the client and PIN has not been set yet. If absent, it indicates that the device is not capable of accepting a PIN from the client. Client PIN is one of the ways to do user verification. uv user verification: Indicates that the device is capable of verifying the user within itself. For example, devices with UI, biometrics fall into this category. If present and set to true, it indicates that the device is capable of user verification within itself and has been configured. If present and set to false, it indicates that the device is capable of user verification within itself and has not been yet configured. For example, a biometric device that has not yet been configured will return this parameter set to false. If absent, it indicates that the device is not capable of user verification within itself. A device that can only do Client PIN will not return the "uv" parameter. If a device is capable of verifying the user within itself as well as able to do Client PIN, it will return both "uv" and the Client PIN option. pinProtocol (0x01) Unsigned Integer Required PIN protocol version chosen by the client. For this version of the spec, this SHALL be the number 1.
keyAgreement (0x03) COSE_Key Optional Public key of platformKeyAgreementKey. The COSE_Key-encoded public key MUST contain the optional "alg" parameter and MUST NOT contain any other optional parameters. The "alg" parameter MUST contain a COSEAlgorithmIdentifier value. pinAuth (0x04) Byte Array Optional First 16 bytes of HMAC-SHA-256 of encrypted contents using sharedSecret. See Setting a new PIN, Changing existing PIN and Getting pinToken from the authenticator for more details. newPinEnc (0x05) Byte Array Optional Encrypted new PIN using sharedSecret. Encryption is done over UTF-8 representation of new PIN. pinHashEnc (0x06) Byte Array Optional Encrypted first 16 bytes of SHA-256 of PIN using sharedSecret. KeyAgreement (0x01) COSE_Key Optional Authenticator key agreement public key in COSE_Key format. This will be used to establish a sharedSecret between platform and the authenticator. The COSE_Key-encoded public key MUST contain the optional "alg" parameter and MUST NOT contain any other optional parameters. The "alg" parameter MUST contain a COSEAlgorithmIdentifier value. pinToken (0x02) Byte Array Optional Encrypted pinToken using sharedSecret to be used in subsequent authenticatorMakeCredential and authenticatorGetAssertion operations. (0x03) Unsigned Integer Optional Number of PIN attempts remaining before lockout. This is optionally used to show in UI when collecting the PIN in Setting a new PIN, Changing existing PIN and Getting pinToken from the authenticator flows. retries counter represents the number of attempts left before PIN is blocked. Each correct PIN entry resets the retries counter back to 8 unless the PIN is already blocked. Each incorrect PIN entry decrements the retries by 1. Once the retries counter reaches 0, the authenticator has to be reset before any further operations can happen that require a PIN. Generate an ECDH P-256 key pair called "authenticatorKeyAgreementKey" denoted by (a, aG) where "a" denotes the private key and "aG" denotes the public key. See [RFC6090] Section 4.1 and [SP800-56A] for more ECDH key agreement protocol details. Retries count is the number of attempts remaining before lockout. When the device is nearing authenticator lockout, the platform can optionally warn the user to be careful while entering the PIN. Authenticator responds back with retries. See [RFC6090] Section 4.1 and appendix (C.2) of [SP800-56A] for more ECDH key agreement protocol details and key representation. If Authenticator does not receive mandatory parameters for this command, it returns CTAP2_ERR_MISSING_PARAMETER error. If a PIN has already been set, authenticator returns CTAP2_ERR_PIN_AUTH_INVALID error. Authenticator stores LEFT(SHA-256(newPin), 16) on the device, sets the retries counter to 8, and returns CTAP2_OK. If the retries counter is 0, return CTAP2_ERR_PIN_BLOCKED error. Authenticator generates a new "authenticatorKeyAgreementKey". Generate a new ECDH P-256 key pair called "authenticatorKeyAgreementKey" denoted by (a, aG), where "a" denotes the private key and "aG" denotes the public key. Authenticator decrements the retries counter by 1. If the authenticator sees 3 consecutive mismatches, it returns CTAP2_ERR_PIN_AUTH_BLOCKED, indicating that power cycling is needed for further operations. This is done so that malware running on the platform should not be able to block the device without user interaction. If authenticator sees 3 consecutive mismatches, it returns CTAP2_ERR_PIN_AUTH_BLOCKED indicating that power recycle is needed for further operations. This is done so that malware running on the platform should not be able to block the device without user interaction. Many transports (e.g., Bluetooth Smart) are bandwidth-constrained, and serialization formats such as JSON are too heavy-weight for such environments. For this reason, all encoding is done using the concise binary encoding CBOR [RFC7049]. To reduce the complexity of the messages and the resources required to parse and validate them, all messages MUST use the CTAP2 canonical CBOR encoding form as specified below, which differs from the canonicalization suggested CTAP2 canonical CBOR encoding form as specified in Section 3.9 of [RFC7049]. All encoders MUST serialize CBOR in the CTAP2 canonical CBOR encoding form without duplicate map keys. All decoders SHOULD reject CBOR that is not validly encoded in the CTAP2 canonical CBOR encoding form and SHOULD reject messages with duplicate map keys. The representations of any floating-point values are not changed. Note: These rules are equivalent to a lexicographical comparison of the canonical encoding of keys for major types 0-3 and 7 (integers, strings, and simple values). They differ for major types 4-6 (arrays, maps, and tags), which CTAP2 does not use as keys in maps. These rules should be revisited if CTAP2 does start using the complex major types as keys. Tags as defined in Section 2.4 in [RFC7049] MUST NOT be present. Likewise, because some authenticators are memory constrained, the maximum message size supported by an authenticator MAY be limited. By default, authenticators MUST support messages of at least 1024 bytes. Authenticators MAY declare a different maximum message size supported using the maxMsgSize authenticatorGetInfo result parameter. Clients, platforms, and servers MUST NOT send messages larger than 1024 bytes unless the authenticator’s maxMsgSize indicates support for the larger message size. Authenticators MAY return the CTAP2_ERR_REQUEST_TOO_LARGE error if size or memory constraints are exceeded. Authenticators SHOULD return the CTAP2_ERR_INVALID_CBOR error if received CBOR does not conform to the requirements above. All command parameters are CBOR encoded following the JSON to CBOR conversion procedures as per the CBOR specification [RFC7049]. Specifically, parameters that are represented as DOM objects in the Authenticator API layers (formally defined in the Web API [WebAuthN]) are converted first to JSON and subsequently to CBOR. Status 1 byte Required The status of the response. 0x00 means success; all other values are errors. See the table in the next section for valid values. aaguid 0x03 byte string (CBOR major type 2). 16 bytes in length and encoded the same as MakeCredential AuthenticatorData, as specified in [WebAuthN]. maxMsgSize 0x05 unsigned integer(CBOR major type 0). This is the maximum message size supported by the authenticator. authenticatorClientPIN_Response keyAgreement 0x01 Authenticator public key in COSE_Key format. The COSE_Key-encoded public key MUST contain the optional "alg" parameter and MUST NOT contain any other optional parameters. The "alg" parameter MUST contain a COSEAlgorithmIdentifier value. 0x00 CTAP1_ERR_SUCCESS, CTAP2_OK Indicates successful response. 0x19 CTAP2_ERR_CREDENTIAL_EXCLUDED Valid credential found in the exclude list. 0x2C CTAP2_ERR_INVALID_OPTION Not a valid option for current operation. 0x3A CTAP2_ERR_ACTION_TIMEOUT The current operation has timed out. 0x3B CTAP2_ERR_UP_REQUIRED User presence is required for the requested operation. In this current version of U2F, the framing is defined based on the ISO7816-4:2005 extended APDU format. This is very appropriate for the USB transport since devices are typically built around secure elements which understand this format already. This same argument may apply for futures such as Bluetooth based devices. For other futures based on other transports, such as a built-in u2f token on a mobile device TEE, this framing may not be appropriate, and a different framing may need to be defined. Each implementation may define any other vendor-specific status codes, providing additional information about an error condition. Only the error codes listed above will be handled by U2F FIDO clients, whereas others will be seen as general errors and logging of these is optional. All of the below conditions must be true for the platform to proceed to next step. If any of the below conditions is not true, platform errors out with CTAP2_ERR_UNSUPPORTED_OPTION. Send the U2F_REGISTER request to the authenticator as specified in [U2FRawMsgs] spec. Let x9encodedUserPublicKeybe the user public key returned in the U2F registration response message [U2FRawMsgs]. Let coseEncodedCredentialPublicKey be the result of converting x9encodedUserPublicKey’s value from ANS X9.62 / Sec-1 v2 uncompressed curve point representation [SEC1V2] to COSE_Key representation ([RFC8152] Section 7). Let flags be a byte whose zeroth bit (bit 0, UP) is set, and whose sixth bit (bit 6, AT) is set, and all other bits are zero (bit zero is the least significant bit). See also Authenticator Data section of [WebAuthN]. Variable Length Attested credential data. Initialized with attestedCredData’s value. Set "sig" to be the "signature" bytes from the U2F registration response message [U2FRawMsgs]. Mapping: WebAuthn authenticatorMakeCredential to and from CTAP1/U2F Registration Messages. 1 Key handle length Initialized with keyHandleLength’s value. and let Control Byte be P1 of the framing. Copy bits 0 (the UP bit) and bit 1 from the CTAP2/U2F response user presence byte to bits 0 and 1 of the CTAP2 flags, respectively. Set all other bits of flags to zero. Note: bit zero is the least significant bit. See also Authenticator Data section of [WebAuthN]. Mapping: WebAuthn authenticatorGetAssertion to and from CTAP1/U2F Authentication Messages. A channel identifier is allocated by the FIDO authenticator to ensure its system-wide uniqueness. The actual algorithm for generation of channel identifiers is vendor specific and not defined by this specification. 8.1.5.1. Transaction atomicity, idle and busy states. The CTAPHID protocol is designed to be extensible yet maintain backwards compatibility, to the extent it is applicable. This means that a CTAPHID host SHALL support any version of a device with the command set available in that particular version. The following list describes the minimum set of commands required by a CTAPHID device. Optional and vendor-specific commands may be implemented as described in respective sections of this document. This command sends an encapsulated CTAP1/U2F message to the device. 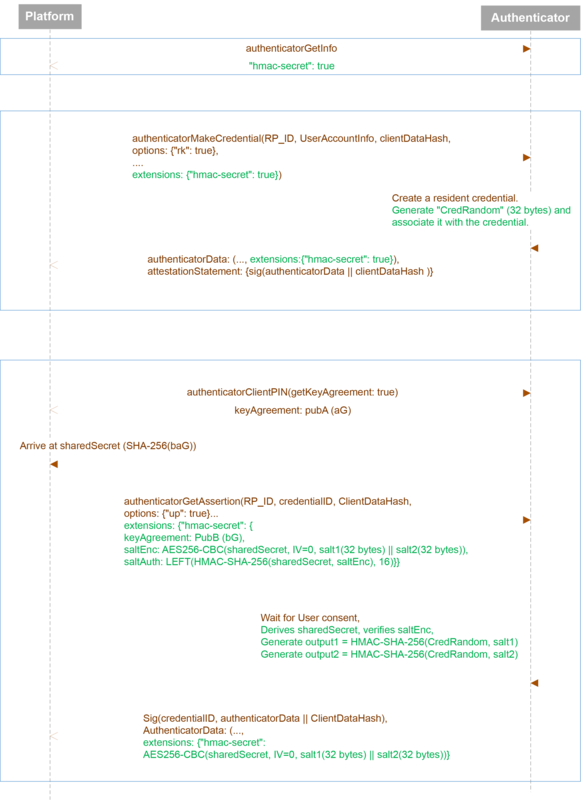 The semantics of the data message is defined in the U2F Raw Message Format encoding specification. This command sends an encapsulated CTAP CBOR encoded message. The semantics of the data message is defined in the CTAP Message encoding specification. Please note that keep-alive messages MAY be sent from the device to the client before the response message is returned. The protocol version identifies the protocol version implemented by the device. This version of the CTAPHID protocol is 2. A CTAPHID host SHALL accept a response size that is longer than the anticipated size to allow for future extensions of the protocol, yet maintaining backwards compatibility. Future versions will maintain the response structure of the current version, but additional fields may be added. The meaning and interpretation of the device version number is vendor defined. The capability flags value is a bitfield where the following bits values are defined. Unused values are reserved for future use and must be set to zero by device vendors. Cancel any outstanding requests on this CID. If there is an outstanding request that can be cancelled, the authenticator MUST cancel it and that cancelled request will reply with the error CTAP2_ERR_KEEPALIVE_CANCEL. Whether a request was cancelled or not, the authenticator MUST NOT reply to the cancel message itself. ERR_INVALID_CHANNEL 0x0B CID is not valid. Note: These values are identical to the BLE transport values. The wink command performs a vendor-defined action that provides some visual or audible identification a particular authenticator. A typical implementation will do a short burst of flashes with a LED or something similar. This is useful when more than one device is attached to a computer and there is confusion which device is paired with which connection. A CTAPHID may implement additional vendor specific commands that are not defined in this specification, while being CTAPHID compliant. Such commands, if implemented, must use a command in the range between CTAPHID_VENDOR_FIRST (0x40) and CTAPHID_VENDOR_LAST (0x7F). Please refer to [ISO7816-4] for APDU definition. Because of timeouts that may otherwise occur on some platforms, it is RECOMMENDED that the Authenticators reply to APDU commands within 800 milliseconds. Clients and authenticators MAY support additional selection mechanisms. Clients MUST fall back to the previously defined selection process if the additional selection mechanisms fail to select the applet. Authenticators MUST at least support the previously defined selection process. Conceptually, framing defines an encapsulation of FIDO2 commands. This encapsulation is done in an APDU following [ISO7816-4]. Fragmentation, if needed, is discussed in the following paragraph. When receiving this, the ISO transport layer will immediately issue an NFCCTAP_GETREPONSE command unless a cancel was issued. The ISO transport layer will provide the status data to the higher layers. Authenticator and client devices using Bluetooth Low Energy Technology SHALL conform to Bluetooth Core Specification 4.0 or later [BTCORE]. Bluetooth SIG specified UUID values SHALL be found on the Assigned Numbers website [BTASSNUM]. The data format for the MSG command is defined in §6 Message Encoding. Note that the errors sent in this response are errors at the encapsulation layer, e.g., indicating an incorrectly formatted request, or possibly an error communicating with the authenticator’s FIDO message processing layer. Errors reported by the FIDO message processing layer itself are considered a success from the encapsulation layer’s point of view and are reported as a complete MSG response. Data format is defined in §6 Message Encoding. ERR_BUSY 0x06 The device is busy and can’t accept commands at this time. Note: These values are identical to the HID transport values. The FIDO Client SHALL be a GATT Client. The FIDO Authenticator SHALL be a GATT Server. 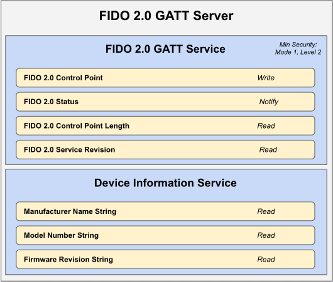 Mandatory GATT services and characteristics that MUST be offered by a FIDO Authenticator. Note that the Generic Access Profile Service ([BTGAS]) is not present as it is already mandatory for any Bluetooth Low Energy Technology compliant device. (*): Mandatory to support at least one of these sub-procedures. (**): Mandatory to support at least one of these sub-procedures. Other GATT sub-procedures may be used if supported by both client and server. For example, a device that only supports FIDO2 Rev 1 will only have a fidoServiceRevisionBitfield characteristic of length 1 with value 0x20. Optionally, the client writes a CANCEL command to the fidoControlPoint characteristic to cancel the pending request. Upon receiving a CANCEL request, if there is an outstanding request that can be cancelled, the authenticator MUST cancel it and that cancelled request will reply with the error CTAP2_ERR_KEEPALIVE_CANCEL. Whether a request was cancelled or not, the authenticator MUST NOT reply to the cancel message itself. Some authenticators might alert users or prompt them to complete the test of user presence (e.g., via sound, light, vibration) Upon receiving any request, the authenticators SHALL send KEEPALIVE commands every kKeepAliveMillis milliseconds until completing processing the commands. While the authenticator is processing the request the KEEPALIVE command will contain status PROCESSING. If the authenticator is waiting to complete the Test of User Presence, the KEEPALIVE command will contains status UP_NEEDED. While waiting to complete the Test of User Presence, the authenticator MAY alert the user (e.g., by flashing) in order to prompt the user to complete the test of user presence. As soon the authenticator has completed processing and confirmed user presence, it SHALL stop sending KEEPALIVE commands, and send the reply. In other words, continuation fragments begin with a sequence number, beginning at 0, implicitly with the high bit cleared. The sequence number must wraparound to 0 after reaching the maximum sequence number of 0x7f. A client needs to register for notifications before it can receive them. Bluetooth Core Specification 4.0 or later [BTCORE] forces a device to remember the notification registration status over different connections [BTCCC]. Unless a client explicitly unregisters for notifications, the registration will be automatically restored when reconnecting. A client MAY therefor check the notification status upon connection and only register if notifications aren’t already registered. Please note that some clients MAY disable notifications from a power management point of view (see below) and the notification registration is remembered per bond, not per client. A client MUST NOT remember the notification status in its own data storage. As noted in §8.3.2 Pairing, a disadvantage of using standard Bluetooth pairing is that the pairing is "system-wide" on most operating systems. That is, if an authenticator is paired to a FIDO client that resides on an operating system where Bluetooth pairing is "system-wide", then any application on that device might be able to interact with an authenticator. This poses both security and privacy risks to users. While client operating system security is partly out of FIDO’s scope, further revisions of this specification MAY propose mitigations for this issue. Note that at times, authenticators may legitimately receive communication from an unpaired device. For example, a user attempts to use an authenticator for the first time with a new client; he turns it on, but forgets to put the authenticator into pairing mode. In this situation, after connecting to the authenticator, the client will notify the user that he needs to pair his authenticator. The authenticator should make it easy for the user to do so, e.g., by not requiring the user to wait for a timeout before being able to enable pairing mode. It is important for low-power devices to be able to conserve power by shutting down or switching to a lower-power state when they have satisfied a client’s requests. However, the FIDO protocol makes this hard as it typically includes more than one command/response. This is especially true if a user has more than one key handle associated with an account or identity, multiple key handles may need to be tried before getting a successful outcome. Furthermore, clients that fail to send follow up commands in a timely fashion may cause the authenticator to drain its battery by staying powered up anticipating more commands. Upon sending a command response that did not consume a test of user presence, the authenticator MUST assume that the client may wish to initiate another command and leave the connection open until the client closes it or until a timeout of at least kErrorWaitMillis elapses. Examples of command responses that do not consume user presence include failed authenticate or register commands, as well as get version responses, whether successful or not. After kErrorWaitMillis milliseconds have elapsed without further commands from a client, an authenticator MAY reset its state or power down. Support the maximum MTU size allowable by hardware (up to the 512-byte max from the Bluetooth specifications). In order to enhance the user’s privacy and specifically to guard against tracking, it is recommended that authenticators use Resolvable Private Addresses (RPAs) instead of static addresses. This section defines an authenticator extension and corresponding WebAuthn extension. This extension is used by the platform to retrieve a symmetric secret from the authenticator when it needs to encrypt or decrypt data using that symmetric secret. This symmetric secret is scoped to a credential. The authenticator and the platform each only have the part of the complete secret to prevent offline attacks. This extension can be used to maintain different secrets on different machines. create() : A boolean value to indicate that this extension is requested by the Relying Party. The salt2 input is optional. It can be used when the platform wants to roll over the symmetric secret in one operation. If set to true, pass a CBOR true value as the authenticator extension input. If set to false, do not process this extension. Verify that salt1 is a 32-byte ArrayBuffer. If salt2 is present, verify that it is a 32-byte ArrayBuffer. Pass salt1 and, if present, salt2 as the authenticator extension input. create(): Boolean true value indicating that the authenticator has processed the extension. Same as the client extension input, except represented in CBOR. The authenticator indicates to the platform that it supports the "hmac-secret" extension via the "extensions" parameter in the authenticatorGetInfo response. The authenticator generates a random 32-byte value (called CredRandom) and associates it with the credential. The platform gets sharedSecret from the authenticator. keyAgreement(0x01): public key of platformKeyAgreementKey, "bG". One salt case: AES256-CBC(sharedSecret, IV=0, salt1 (32 bytes)). Two salt case: AES256-CBC(sharedSecret, IV=0, salt1 (32 bytes) || salt2 (32 bytes)). The authenticator waits for user consent. The authenticator generates "sharedSecret": SHA-256((abG).x) using the private key of authenticatorKeyAgreementKey, "a" and the public key of platformKeyAgreementKey, "bG". SHA-256 is done over only the "x" curve point of "abG". See [RFC6090] Section 4.1 and Appendix (C.2) of [SP800-56A] for more ECDH key agreement protocol details and key representation information. The authenticator verifies saltEnc by generating LEFT(HMAC-SHA-256(sharedSecret, saltEnc), 16) and matching against the input saltAuth parameter. Same as the client extension output, except represented in CBOR. This section registers the extension identifier values defined in Section §9 Defined Extensions in the IANA "WebAuthn Extension Identifier" registry. Description: This registration extension and authentication extension enables the platform to retrieve a symmetric secret scoped to the credential from the authenticator. See FIDO Security Reference document [FIDOSecRef].